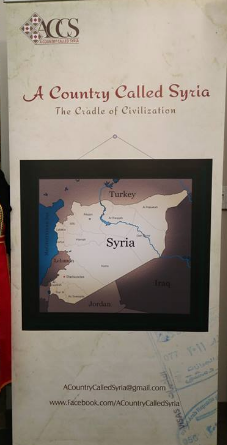 [UPDATE: on December 9 it was announced by ‘A Country Called Syria’ that the map has made it back in the forefront of the exhibition]. Without their consent or warning, the banner was stripped out of our exhibit exactly 14 days prior to closure. This means guests will no longer know the name of the organization, contact information or social media outlets. A Country Called Syria is a nonpartisan organization dedicated purely to educating on SYRIA and its history, culture and valuable contributions to the world, as well as the humanitarian crisis it is currently crumbling beneath. With all that, there are individuals on campus still concerned with whether or not the barely visible tip of ONE country is labeled, as opposed to everything else necessary to fixate upon? So much so that the campus staff and administrators felt fearful enough to tear down an essential piece of the exhibition. #Palestine2Pipeline campaign unites Palestinians and Native Americans at Standing Rock!